(re-XD) was created by Tricia Austin, University for the Arts London, and Tim McNeil, University of California, Davis. 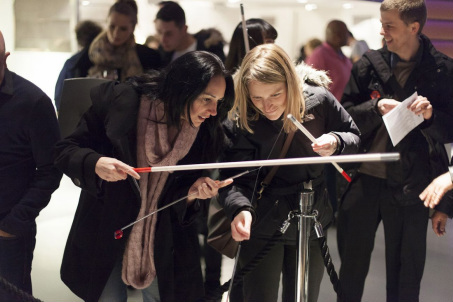 They curated the first Chaos at the Museum summit in London 2014. Its goal, to bring together a global roster of thought-leaders, strategists and practitioners to address and inform this evolving design discipline. re-XD believes that exhibition design impacts communities for the better, connecting audiences with objects, information and ideas both inside the museum space, and outside in the broader public realm. A series of international forums questioning, critiquing and forging new approaches to Exhibition Design. The field spans cultural and commercial sectors encompassing museums, visitor centers, narrative environments, experiential marketing, and theme parks. Chaos at the Museum convenes participants with divergent views from all sides of the exhibition spectrum to create a design-centric forum for debate, analysis, and future collaboration and exchange. The most recent convening of this forum was in November 2016, in Buenos Aires, Argentina, with the focus on “Infiltrating the Urban Fabric.” This 3-day event was organized through a partnership between Clare Brown, GWU Corcoran School of the Arts & Design, Tricia Austin, University for the Arts London, and Tim McNeil, University of California, Davis, the Argentinian cultural organization Theory and Practice in the Arts (TyPA) and the Museo de la Ciudad, Buenos Aires. Redefine the term “exhibition design”, it is outmoded and no longer represents the diversity and rigor of the discipline. Provide an open, design centric forum for advancing the exhibition design discipline. Bring together an international roster of speakers/facilitators that are representational of the global exhibition design sector and economy. 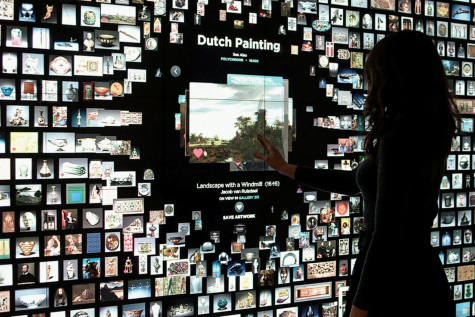 Look at emerging areas of exhibition and experience design and foster their growth. Introduce less prominent case studies that challenge the traditional exhibition design approach. Highlight best practice- those individuals or projects that are shifting the exhibition design paradigm and including audiences in new and thoughtful ways. Tackle a new theme, in a different country at each annual symposium. Be ambitious but small in terms of outreach, invite a few select speakers from across the globe. Students, researchers and professionals participate equally in the dialogue and exchange. Focus less on the “celebrity” designers and more on those who are really making a difference. Encourage debate and include participants with contrasting perspectives and ideologies. Develop international project partnering and exchange opportunities for faculty, students and professionals. Wall Collection at Cleveland Museum of Art designed by Local Projects. Credit: Local Projects. Tricia Austin is the Course Leader of MA Narrative Environments at CSM. Tricia is interested in evolving models of multidisciplinary collaboration and the development of design practice for story-led placemaking and visitor experiences. Most recently Tricia was the lead in CSM’s partnership in the EU funded, two-year EU-PA project which designed and produced arts and design installations in cities across Europe to test and develop culture-led city regeneration strategies. Tim McNeil is the Director of the UC Davis Design Museum, and a Professor of Design at the University of California Davis, where he is the primary instructor for courses on exhibition design. His research and creative work defines exhibition design in relation to the curatorial process, and explores the exhibition medium as a creative space for the effective communication of objects and narratives. McNeil is an experienced design practitioner and a principal with Muniz/McNeil, a multi-disciplinary design and research practice. Clare Brown / Chief of Design at the National Museum of American History, Washington D.C.
Clare Brown is an Exhibition Designer with 20 years experience designing for history museums in New York City and Washington DC. From 2012 to 2017 Clare was the Program Head, and Assistant Professor of Design for the MA Exhibition Design program at the Corcoran School of the Arts + Design, The George Washington University. Clare is currently working on doctoral research for a PhD in “Exhibition Design as Experience Design” at Central Saint Martins, University of the Arts London, in Fall 2016.